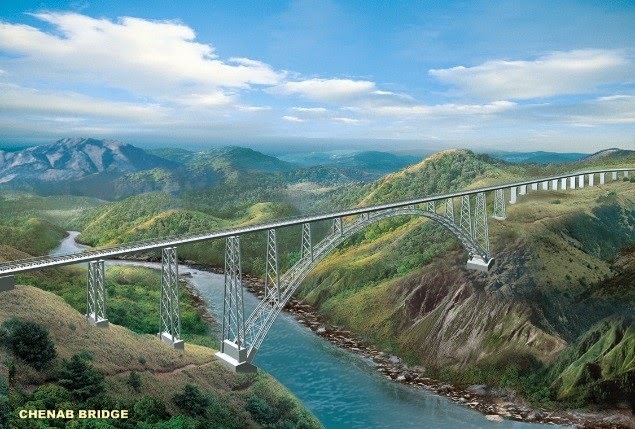 Indian Railways plans to complete the Chenab Bridge in Jammu and Kashmir by 2016, making it the world's highest rail bridge. The bridge will be five times higher than Delhi's Qutub Minar and far taller than the Eiffel Tower in Paris. It is being constructed across Chenab river-bed in Salal village of Reasi district. It is a part of project that will connect Baramulla and Srinagar to Jammu via Udhampur-Katra-Qazigund covering the entire route in about seven hours. Currently, it takes exactly double the time - 13 hours - to reach Jammu from Baramulla in northern Kashmir, which is 60 km from Srinagar. Indian Railways has undertaken the Jammu-Udhampur-Srinagar-Baramulla Rail Line (JUSBRL) mega-project construction which has been declared a national project. The alignment is a combination of a large number of tunnels and bridges. The alignment crosses a deep gorge of the Chenab River, near Salal Hydro Power Dam, which necessitated construction of a long span bridge. 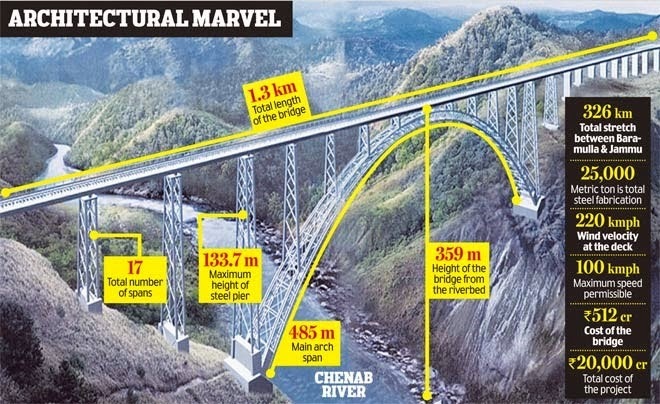 The bridge will have a lifespan of 120 years and will contribute to the economic development, better transportation accessibility to the state and the country.The height of Chenab Bridge is 390 meters exceeding the current tallest bridge on France’s Tarn River (tallest pillar rises 340 meters while the actual height at which trains run on the bridge is 300 meters). The construction of the JUSBRL was started in 2003 when Atal Bihari Vajpayee was the prime minister. 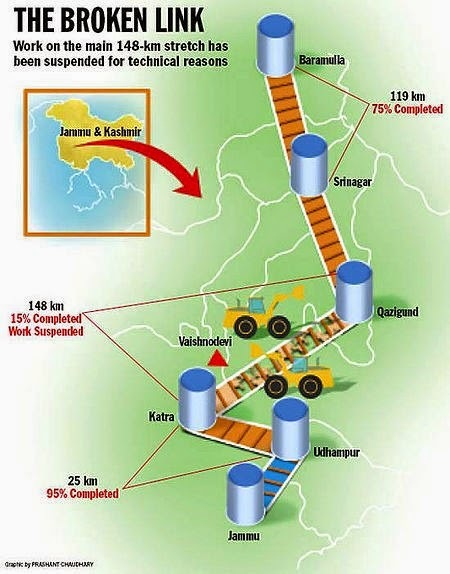 Construction of the Jammu-Udhampur section was completed and opened in April 2005. The project was stopped in September 2008 when the construction of bridge was announced to be unsafe despite the completion of the approach viaducts in 2007. Difficult geological conditions, access problems, tunnel excavation difficulties, labor disputes and development of a lower, more direct route through tunnels were cited as reasons. The alignment of the JUSBRL project was reviewed to give solutions for the challenges faced. In 2009, the review was submitted to the Railway Board and was approved. The design of the bridge, however, was approved in July 2012. The construction of the project restarted in 2010, and has now been declared a national project. As of early 2013, the latest word is that the original route is back on track and the bridge will be built as originally planned. There are many challenges that the project faces. One of the main challenges is that the river valley is prone to high wind pressure. The wind speed might disturb the stability of the bridge. The second major challenge to the bridge is the safety and security since the Jammu and Kashmir area is prone to frequent terrorist attacks. Other challenges include seismic nature of the area, possible low temperatures, lack of connectivity to the construction area, complicated terrain and requirement of huge quantities of steel and concrete.The structure has been designed such that it tackles all the challenges that have been listed. It is designed to resist a temperature of -20 degrees Celsius and a wind speed of 260 kmph. The trains may move at 100 kmph over the bridge. However, an anemometer has been provided at the bridge site which measures the wind speed at the bridge site, and will interlock train movement over the bridge automatically if there is any wind above the prescribed speed. The bridge is being made of 63 mm-thick blast proof steel and concrete pillars that can withstand explosion for safety and security. A ring of aerial safety and online monitoring would also be provided. The bridge would be painted by special paint that is corrosion-resistant for 15 years. alignment to fight the problem of curvy horizon. The challenges during construction have been overcome by building roads of almost 5 kilometer length. The cost of roads constructed for entire JUSBRL project itself sums up to around 2000 crores (250 kilometers). The cranes used for construction are largest in the world. The railways have constructed a helipad to transport construction material and equipment. The selection of steel arch for the bridge also has got significance. The arch shape would best absorb the seismic forces and its thrust would stabilize the slope of the river. The arch shape which was invented by the Romans, requires less material forbridges exist in only about six other countries. Also coming to safety, the arch is designed such that even if an element is removed from the structure, the trains may move at 30 kmph. The choice of steel over concrete is because steel is easy to construct and maintain. The arch would be the 7th longest arch in the world. There are challenges related to quality standards as well. Indian railway standards are applicable only to bridges of 100m. There are no other Indian codes or design guidelines for such massive structures. 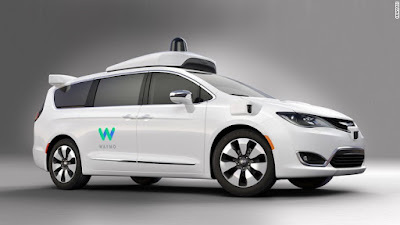 Thus though indigenous material is being used, design is being augmented with additional international codes and standards that enable the designer to produce a safe design. BS: 5400 is used as the basic guideline for design and construction. There are many parties that are involved in the completion of the project. Amberg Engineering was appointed to carry out review work of the alignments. Konkan Railway Corporation is executing the project. Design and construction of the bridge was awarded to a joint venture of Afcons Infrastructure, Ultra Construction & Engineering Company of South Korea and VSL India in 2004. Force Technology Laboratory based in Norway has been employed to conduct several wind tunnel tests and understand the impact of wind speeds on the bridge. Finland-based WSP Group and Germany-based Leonhardt Andra and Partners are the consultants for the project. The steel plates have been procured from the Bhilai plant of Steel Authority of India, while the girders are assembled at a fabrication workshop built adjacent to the bridge. AkzoNobel was awarded the painting services contract for the bridge. Railway Police (GRP) and Railway Protection Force provide security to engineers and workers implementing the project. The support of locals in completion of the project has been very significant. The support has been two-way since the project has already given jobs to 500 locals.